What is Uttarabodhi Mudra? The Uttarabodhi mudra is called the mudra of supreme enlightenment, also called “best-perfection” mudra. As the sun of enlightenment dawns, fears are dispelled. Both hands are held at the level of the chest, the two raised index fingers touch one another, the remaining fingers are crossed and folded down, the thumbs touch each other at the tips or are also crossed and folded. Uttarabodhi Mudra is frequently seen in images of Vairochana. It is a hand gesture that clearly evokes a sense of unshaked unity within oneself in aligning with the one source. A Buddha of this mudra brings about a realization that we should fear nothing or nobody except God. So where is the best FengShui placement for a Uttarabodhi Mudra Buddha? 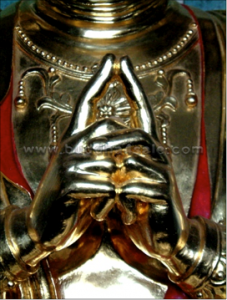 It is highly recommended to consecrate a Uttarabodhi Mudra Buddha In the South or North Bagua areas of home and office, or place it in a prominent, high energy spot in your living room, etc. Just by looking at this Buddha hand gesture one can connect to the energy of deep peace and serenity. It is a powerful FengShui decor adapt to any places!